In 1979, Joe McCullough was recruited by a small Irish company as “an Irish-American with an MBA from a good school who wasn’t yearning for the green fields.” During his 27-year career McCullough, now executive chairman, has seen Oldcastle grow from a $14-million business to the largest construction products company in North America with sales in excess of $15 billion. McCullough grew up in the Ardoyne area of Belfast. He moved to London for work in the 1960s. It was there he met his future wife, Mary Alyce, a nursing student from Maryland. 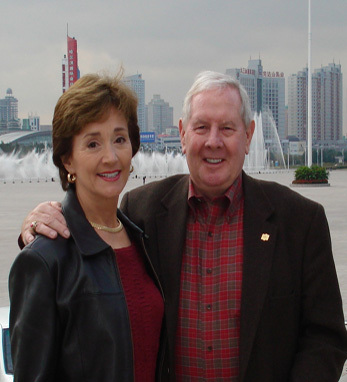 They have been married for 38 years and reside in Atlanta, and have two grown children, Judith and Eamonn. In summing up his career with Oldcastle, McCullough highlights the satisfaction of accomplishment and of working with and building friendships with his Irish, American and European colleagues. He points out that working with an Irish company allowed him to maintain his ties to the homeland but also afforded the opportunity for his American-born family to establish an Irish heritage in their own right.